Her New Identity, and What's Next . . . The first Mary Ellen Taylor novel just came out and I know readers would like to know a bit more about it. Please give us a peek at the plot. Absolutely! 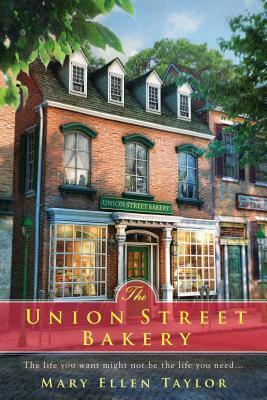 Briefly, THE UNION STREET BAKERY, introduces Daisy McCrae, who's returned to Old Town and is living over her family's bakery after losing her boyfriend, her job and most of her money. Already expected to save the almost-bankrupt bakery, she's pulled into a mystery tied to the historic town via a journal written by a slave girl in the 1860s. There are ghosts whispering in the attic, her baker plans to retire and her ex- fiancé turns up on her doorstep. Plus, for Daisy, abandoned at the bakery by her mother and adopted by the McCrae's, being back stirs up old anger, longing and the need to know who abandoned her and why. I understand that while this is the first Mary Ellen Taylor novel, it's not your first novel. Is that correct? Yes. Mary Ellen Taylor is the alter ego of Mary Burton. As Mary Burton, I write romantic suspense. THE SEVENTH VICTIM is the latest of those and it came out just a week before THE UNION STREET BAKERY. THE UNION STREET BAKERY is a story I wanted to tell for a long time. I worked on it on and off, developing the plot and experimenting with characters but I just wasn't happy with it. Then Daisy McCrae coalesced for me and the book came alive. And, while I love writing romantic suspense, I'm delighted to be developing this other "voice" and grateful that readers are enjoying it. Can we expect more Mary Ellen Taylor novels? You bet! I've just sent off the manuscript, SWEET EXPECTATIONS, for my second Mary Ellen Taylor book and, fingers crossed, I hope to be writing both "women's fiction" and suspense for a very long time. In the book, Daisy struggles with issues related to having been adopted, and I know you've said adoption is a personal issue for you. How so? Both my grandmother and my daughter are adopted, so understanding and sharing the challenges adoptees and their families face is important to me. These are often primal issues about belonging, loss, self worth, abandonment and family history and, in the book, they are a big part of what makes Daisy Daisy. I think many people are surprised at the idea that adult adoptees still have these concerns and I think that's because they just haven't had a reason to think about it. THE UNION STREET BAKERY includes four of the bakery's recipes. What are they? I've include Sugar Cookies, Rachel's Carrot Muffins, Hennie's Freedom Biscuits, and Mike's Chocolate Espresso Torte. Is there a significance to the names of the recipes? Yes there is. For instance, Daisy's sister Rachel is a true artist and it's evident in everything she makes, from her addictive Carrot Cake Muffins to an intricately decorated birthday cake for 100. It seems right that one of the recipes in the first book includes her name. Mike's Chocolate Espresso Torte honors her wonderful, talented late husband. And it just so happens that these two recipes are Rachel's specialties. I'm not going to tell you about Hennie's Freedom Biscuits because it might be a spoiler. And Sugar Cookies (sigh) are the treat Daisy was enjoying when her mother abandoned her. Do you do a lot of baking? I always say you can gauge how my writing day has progressed by the number of cookies I've baked. Cooking and especially baking have always been favorite creative outlets for me. They give me a chance to mull over ideas about characters, dialogue and potential roadblocks while I do the familiar tasks of mixing and blending. If you find a mound of cookies on my kitchen counter, it's a sure sign I'm working through plot twists and turns. THE UNION STREET BAKERY is the first time I've combined two passions--baking and writing--to tell a story. And in your "spare" time? When I'm not writing, you can usually find me enjoying writer and reader conferences or signing my latest book. When that's not the case, I spend time learning more about food, cooking and baking. Completely bored yet? I love it. I've been a kitchen assistant for more than fifty culinary classes over the past seven years at Sur la Table and at the University of Richmond's Culinary Arts program, where I'm pursuing my Baking and Pastry Arts Certificate. I also enjoy spending time with family and with our two miniature dachshunds, Buddy and Bella, as well as yoga and hiking. First of all, on sites like yours which share book news, reviews and author interviews. More directly, they're always welcome to visit www.maryellentaylor.com and www.maryburton.com. I have a blog and --for those who share my love of cooking and baking-- there are recipes. I also share updates on Facebook and Twitter. Plus, I love to meet readers in person and all of my signings and appearances are listed on both sites. I'll be at the RT Book Review convention in Kansas City in May to present a workshop, visit and sign at their Giant Book Fair. In March I'm at the Virginia Festival of the Book in Charlottesville and then in April I'll be at Barbara Vey's Reader Appreciation Luncheon in Milwaukee. Please let your readers know that if they’re at any of these events, I’m hoping they'll come up and say hello. Well, I have THE SEVENTH VICTIM out now, and the second of my novels set in the Austin area, NO ESCAPE, will be published in November 2013. It brings back Dr. Jolene Granger from THE SEVENTH VICTIM and we get her story along with that of Ranger Brody Winchester. Then, as Mary Ellen Taylor, I return to the McCrae sisters of the Union Street Bakery with SWEET EXPECTATIONS, which also comes out in November. Thanks, Mary. We'll be waiting. And thank you for letting me spend time with your readers. Thanks! What a nice interview. Sounds like a good story! This book sounds great to me..May you have a wonderful day. All I had to do was see the title of Mary's book to know that I wanted to read it because I grew up on Union Street in Schenectady, NY and while our "home" wasn't over a bakery it was over not only a doctor's office but also a Real Estate office as well! I can't wait to find out more about journal dating back to the 1850s that Daisy found. In our attic I found some old letters sent my a husband on his journey to the goal field in California back to his wife in New York that kept promising to "send money home soon". I can remember not wanting to stop reading about his time on entering "Indian" country as he left western New York to when he was a Sherrif in the "western badlands". I've always wondered if his poor wife ever did receive any money and if he ever made it to California because the letter ended. I'm really looking forward to reading more about what Daisy find out with her letters and how it will change how she feels about herself and those around her. Thanks for the interview, this book sounds like one I will really enjoy. I look forward to hearing about the new Mary Ellen Taylor book coming out later this year also. Hope you enjoy writing a new genre. Thank you so much for a chance at winning in your awesome giveaway! !